Once again, the Parc OL has the pleasure of hosting an exciting new event: a Monster Jam® show on 24 June 2017. The Parc OL hasn’t finished surprising you! Monster Jam® is an authentic American motor sports and monster trucks show with 1500 horsepower and over five tonnes of metal doing extreme stunts. On a set course or going freestyle, these behemoths will provide thrills and spills when they attempt to get over daunting obstacles … A guaranteed spectacle for all the family! Lovers of excitement and of American spectacle, Monster Jam is for you! These Monster Jam® Trucks, including the legendary Grave Digger®, Max-DTM, El Toro Loco®, Pirate’s Curse®, Monster Mutt®, Scooby Doo® and many others, will compete in freestyle races on the all-terrain circuit in the heart of the Parc OL, to thrill spectators of all ages. Lovers of thrills on two wheels will also appreciate the stunts of the best Moto-cross freestyle riders. The specators will be able to experience a unique live event when they have access to the paddock in the morning to check the vehicles out and meet the drivers. The Monster Jam® show is touring the world and is set to stop by Lyon for the first time, on 24 June, the chance for a large family-friendly crowd to witness an amazing spectacle in a fun atmosphere. 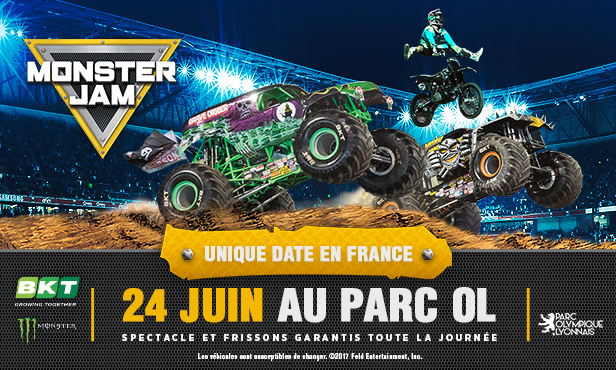 More information on Monster Jam®, 24 June 2017 is available in the events section of parc-ol.com.